Diwali is probably the biggest and most popular Hindu festival. Also known as Deepavali, the festival symbolizes the victory of good over evil and light over darkness. It is celebrated in the Hindu month of Kartika by worshipping goddess Lakshmi, lighting oil lamps, bursting firecrackers and preparing sweets and snacks. People clean or renovate their home before Diwali and on the day of the festival decorate their homes with flowers and lamps. People dress up and meet their friends and relatives. The celebration is incomplete without the Diwali sweets and snacks. 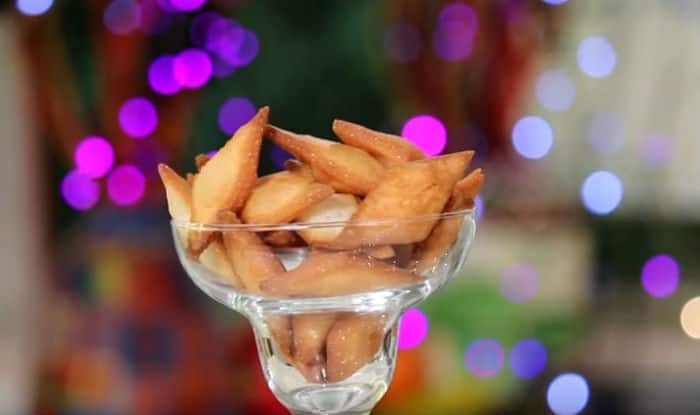 A week before Diwali, sweets and savories are prepared and one of the must-have foods for the festival is shankarpali or Shakkarpara. The crisp shankarpali is loved by both children and adults. So, here’s the recipe for shankarpali by Sanjeev Kapoor. (ALSO READ Here’s How to Make the Perfect Poha Chivda at Home This Diwali). You will have to prepare sugar syrup in the beginning. Place a pan over the flame and add half a cup of water to it. Add the sugar and mix it. Let the water boil and melt the sugar. Keep this sugar syrup aside. Take two cups of refined flour in a plate and add half a cup of semolina. Now, add the ghee and mix well. Transfer this refined flour, semolina and ghee mixture to a whisker and add salt to taste. Mix it using the whisker while gradually adding the sugar syrup. Once the mixture is well incorporated, take it out on a plate and knead it into a dough. You can dust some refined flour if needed for kneading. Keep the dough aside for about 15 minutes. Place a kadai over the flame and heat the oil for deep frying. Take the dough and divide it into equal parts and roll out each portion. Now, cut the rolled out dough into medium-size diamond shaped pieces. Put these pieces into the hot oil and fry it until it becomes golden brown. Once done, take it out and put them on absorbent paper. Your shankarpali is ready. Here is the video of the recipe. You can enjoy shankarpali hot or store it in an air-tight jar. The kids will love it. Happy Diwali! What are the stars doing on Diwali?